Japanese Episode AG 112: "Rune Jimu! Mizu no Aatisuto - Adan (Kouhen)"
American Episode 383: "Eight Ain't Enough"
The battle continues! The Angel's Kiss (Sweet Kiss) attack launched by Luvcus confuses Juptoru, making it hurt itself before Luvcus delivers an attack that knocks the grass-type pokemon out. Satoshi recalls his pokemon and brings out Heigani again, who is unable to keep up with Luvcus once its Swift Swim attribute kicks in. The roughneck pokemon finds a way to get around Luvcus' speed, however, and defeats it with a powerful Crab Hammer attack. 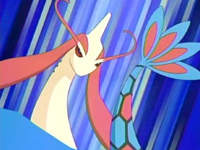 Adan's next pokemon is Namazun, who quickly ends the battle by crushing Heigani with its massive body. Satoshi's next pokemon is Ohsubame. Namazun seems to have the advantage when it dives underwater, but Ohsubame shows its invincible determination by diving underwater and hitting Namazun with its Hatching Swallow (Aerial Ace) attack! Adan is now down to his final pokemon, but, as expected, it's his most powerful team member: Milokaross! The water pokemon makes quick work of Satoshi's Ohsubame, leaving him with only his Pikachu to finish the battle. Pikachu keeps attacking and attacking, but no matter how much damage it inflicts, Milokaross is able to rebound with its Recover technique. Satoshi notices that even though Milokaross keeps using Recover, the pokemon is starting to become worn out. Right when Milokaross seems its most vulnerable, Satoshi he orders his Pikachu to using its strongest electric attack while underwater. The water amplifies the mouse pokemon's attack, delivering enough voltage to knock Milokaross out. Now that all of Adan's pokemon have been defeated, Satoshi has earned the Rain Badge! Adan congratulates Satoshi and tells him that the Houen League will be taking place in three months in a place called Saiyuu City. He also tells Haruka that there's a contest coming up in Kinagi Town, so it's decided that the group will head there so Haruka can compete to earn her fifth and final Contest Ribbon. It's time for Satoshi's final Gym Battle in the Houen Region! The battle is pretty decent, and I guess I don't find any of the victories to be cheap or unsatisfying. It's certainly better than the Fuu and Ran Gym Battle, that's for sure. The dub gives us the horrible pun that I knew they would (they make up for it later, though), but that's really the only extraordinary thing to report. Two seconds are cut from the first shot of the flashback. Two more seconds are cut from the episode's title screen. And another second is cut from the shot of Juptoru we see immediately after the title screen. I remember, a few years ago, reading an article about Bruce Falconer, the man responsible for rescoring the music in the Dragon Ball Z dub. I couldn't find the article online to provide you guys with a link, but I remember one portion of the article in which he's talking about scoring a scene where Gohan is being scolded by his tutor in one of the early Trunks saga episodes. He talks about how he wasn't able to score any dramatic music for the scene because the visuals of a little boy being struck by his teacher were considered to be too strong, so he was forced to create "light" background music that would provide a contrast to the intense action on-screen. In this way, the music is used to soften the intensity of the original version, preventing the scene from having to be cut when it was aired on TV. In a way, I sort of see the scene where a confused Grovyle keeps banging its head against the pillar as falling under the same category. In the Japanese version, the music is very serious and dramatic, and that combined with the image of a pokemon slamming its head into a stone pillar makes the scene really intense. But the music in the dub is the same music they play whenever someone is doing something goofy or playful, and I think the reason is the same as it was in Dragon Ball Z's case. 4Kids or Kids' WB! or somebody thought the scene was a little too much, so they decided to lighten the mood of the whole thing by playing goofy music. If it weren't for the goofy music, the scene could have been considered to be too violent and may have been cut. So, you know, if we get a mostly uncut episode at the expense of a somewhat inappropriate song choice, then I guess I can live with that. Jessie: "Seems more like Don Juan if you ask me." Ugh...I will say, however, that I did laugh later on in the episode when James is referred to as "the artist presently known as Juan." So I guess that Prince reference makes up for the terrible pun I quoted above. The shot right after the Trainer's Choice commercial break is shortened by a second.